Correct me if I'm wrong, but I don't think we have a thread specialized for people to show off their helm collections. It would be nice to see a mix of both entry-level and higher end products to suit everyone's budget and taste. Here's mine: two from Valentine Armouries and 1 from Mercenary's Tailor. 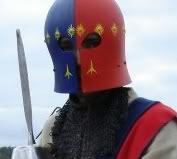 The original helm I got, which had its first paint scheme based on a black sallet from germany. The idea for that one came from a barbute in the wallace collection with some white paint around all the rivets. My helm is painted in the colours of the plantagenets, with a yorkist sun in splendor over each rivet. I also went so far as to undercoat each rivet area white before painting the suns, so it would be a bit more like the wallace one. 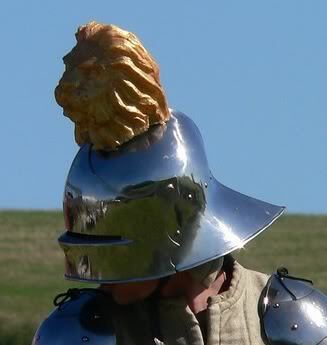 Part three, is my sallet, seen here with a cast lions head that provided target practice for my friends in a mounted crest mellee. Part four is coming soon, and its going to be something special. 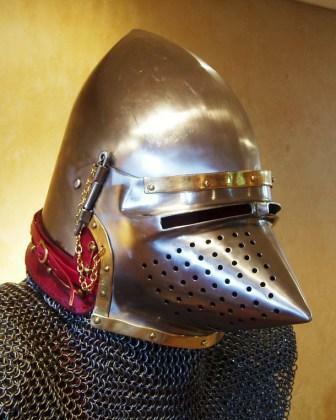 Esthetically, I'm a fan of bare gleaming metal myself, but I admire people who make the effort to personalize their armor with period-accurate decoration (not to mention actually getting out in the field and using it!). Boris, that is an awesome helm, doy you mind if I ask where you got it, who made it? Here are a couple I made to go play in. 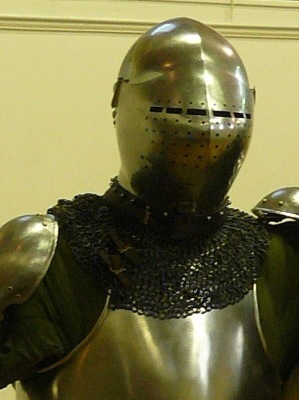 My new GDFB bascinet. I've added the aventail, hinge pin chains, custom liner (SCA), chin strap (SCA), and visor retaining strap. EDIT: Jeff, it seems i ACCIDENTALLY reported your post, instead of quoting it, now how do i un-report it? I want to compliment you on having a visor retaining strap that blends in well. It helps keep the helmet looking good while still meeting your pratical needs. Awesome - those are worthy of public display. 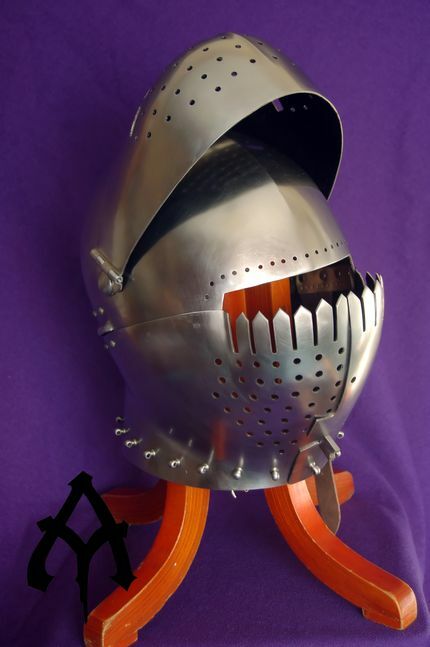 My sallet in the Italian style of ca. 1500. I think I'd rather have a good, plain German sallet of the same period, so this one probably won't stay in my collection for very long. Fun project, though. Fantastic helmets so far. Keep more pictures coming. The helmet is the face of a good harness. As soon as I can get into an armourers shop, I'll be doing the pin & chain arrangement on mine as well. it'd be nice to be able to easily take off the visor without losing the pins. It was fixed many hours ago. Lovely helmets everyone, I especially like the painted helmets. It is a period touch that many skip because they feel it looks gaudy or modern. I personally love it when people post items made for historical accuracy, rather than easy sale. I was talking to a smith recently who spoke about how he would love to go for more accurate pieces, but knows that people won't buy them because they will think they look odd or flawed. Swords in period often have "flaws" unacceptable to the modern consumer: guards longer on one side than the other, pommels with slots "to large for the tang", blades with improper heat treat, etc. So many items in history looked different than our opinion of what they "should" have looked like. The medieval world has so many fallacies woven into modern culture that even the best often think of the fallacy as reality. I have spoken to Ivy League professors who will swear swords weighed ten pounds, or people only dressed in greys and browns. I love when I see things like the painted helms shown above. It means we are progressing. My heart is filled with gladness every time I see a knife scabbard painted with "garish" colours, scabbards covered in linen instead of leather, brightly painted armour. I am not saying that helmets were never bare metal, leather covered scabbards didn't exist, nor that all knife scabbards had red and yellow paint, but now it seems that bare and dreary is all we see. We brush aside things as inaccurate without investigation, and it is nice to see parts of history that are "unpopular" come to life. At this point I am rambling, so I will end before I bore you all to the grave. I know some of you guys got helms for Christmas - can you help keep this thread going? Top shelf left to right: Mycenaean boar tusk helmet, late Bronze Age helmet from the Mycenaean Warrior Vase, Philistine "feather" helmet, all made by me; 2 Roman helmets I made from brass spun domes, a Montefortino and a Coolus E; Norman nasal helmet from Albion; 13th century kettle hat (I converted a Civil Defense helmet); great helm and sallet (both by me); and 17th century pike pot (by an English craftsman named Cole). 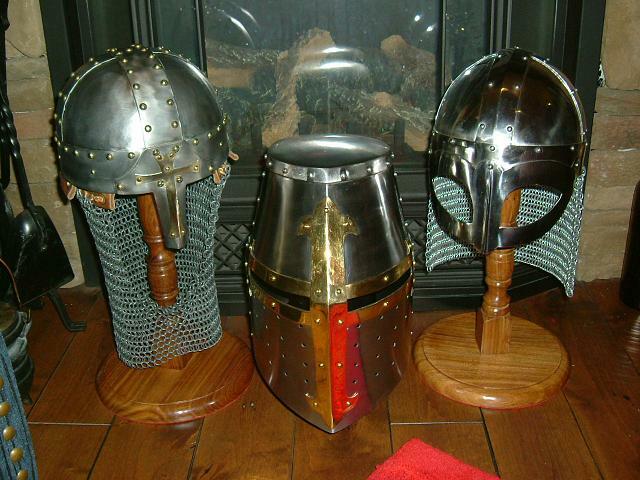 Bottom shelf: Villanovan helmet that I slapped together on a spun bowl; modern Kevlar helmet and a Viet Nam-era M-1 steel pot; steel Uruk-hai helmet from the Two Towers movie, and 2 orc helmets of my own design. 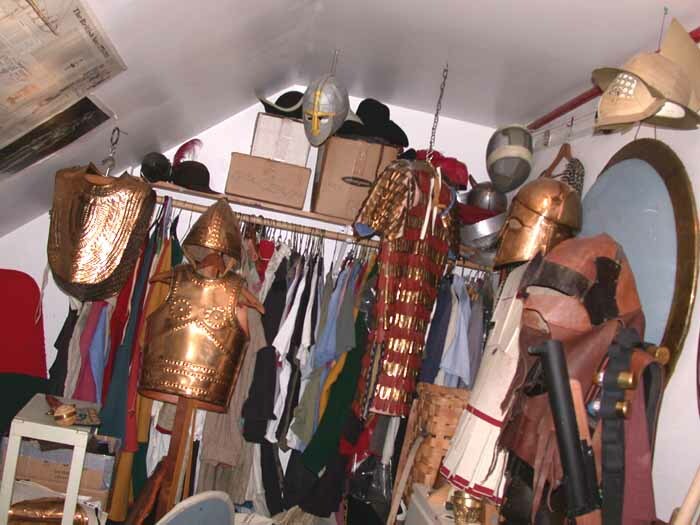 Hidden in the blue bag on the floor is my Roman lorica segmentata and Gallic G helmet (which is what I usually wear for Roman gigs). 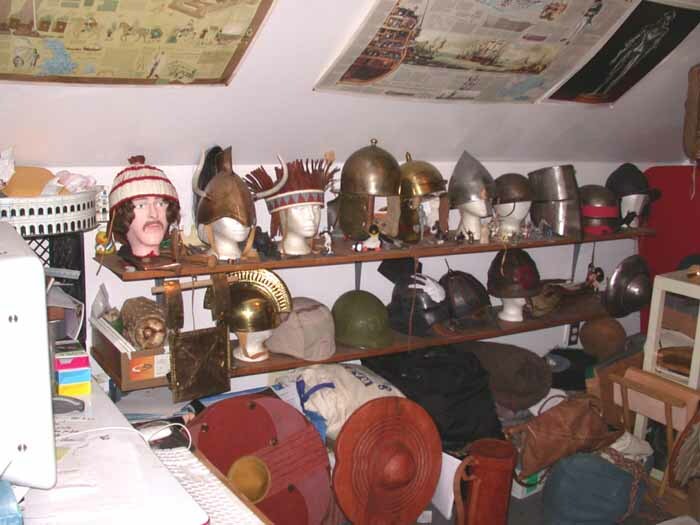 At left, European Late Bronze Age helmet that I copied from one in the Guttmann collection; to the right is my Corinthian helmet (by Joe Piela) with my hoplite kit; and the rest of my Uruk-hai gear with the leather and metal helmet (yes, with an M-79 grenade launcher!). The Sutton Hoo and gladiator helmets hanging from the ceiling are paper models! Just below the fencing mask is a plastic kid's viking helmet with horns. And of course various bronze cuirasses!